I spotted one of my favorite forest dwellers during a walk in the woods yesterday: six-spotted tiger beetles (Cicindela sexguttata). The beetles have a curious affinity for hanging out on woodland trails and they can certainly liven up a hike. 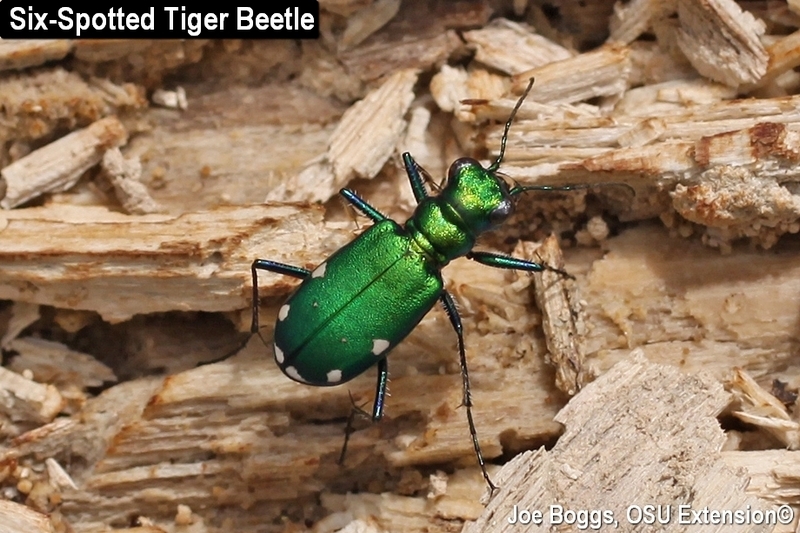 The beetles are well-named because these tiny "tigers" hunt, kill, and eat other insects. The overall color of these shiny beetles varies from deep emerald green to slightly bluish-green depending on the angle of the light. Six white spots are arranged along the trailing edge of the wing covers, three spots per side. The spots are small and sometimes obscured by light bouncing off their highly reflective shiny bodies. The beetles have bulging black eyes (the better to see you with, my dear!) that makes them look like they're wearing goggles. The beetles are agile flyers and their excellent eyesight coupled with long legs which gives them swift speed can make getting a close look difficult. However, a close examination of this ferocious predator will reveal powerful sickle-shaped mandibles that are used to grab and dispatch luckless arthropod prey; a trait that is shared with other tiger beetles (family Carabidae (Ground Beetles); subfamily Cicindelinae (Tiger Beetles)). A word of caution: these carnivores can also use their impressive mandibles to deliver a painful bite to the hand of the overly curious. Even the larvae of this tiny tiger are predators. However, instead of actively hunting their prey, they conceal themselves in vertical burrows in the soil to await hapless victims. When a meat item such as insects or spiders walks past, the tiger larva springs forth like a jack-in-the-box to grab dinner with their powerful mandibles. The bottom line is that six-spotted tiger beetles are highly effective and important predators throughout their life cycle. So, keep your eyes peeled for and hands away from these tiny tigers prowling our woodland trails ... and don't kill them since they are good guys!